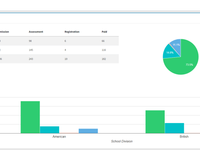 Schools who need to have a full management system to optimize school administrator & teachers work with 1-Single Friendly Interface for Parent and Students. SCL is one of the finest School Management System in its category with Premium high-end educational and management modules - providing a unique user experience which provides a comprehensive yet simple interface which makes any user feel at ease while using the application across any platform. 2. Very effective method to link teachers and parents. Cons: 1. It requires double work to create an assignment; example If I want to create a Classwork for today, I have to do the same process many times if I teach many classes. 2. Each time I create an assignment, hundreds messages with names of my students are sent to my inbox inform me that I created these assignments, While it's enough, a notification with the class name. 3. It's not easy to send the same message to more than one parent at the same time, I have to send it individually and this also requires double work. Overall: A very effective way to link teachers and parents. I would just like to clarify that with SCL you can create Multiple Assignments for all classes at Once. Also you can easily select more than 1 Parent or select all parent at once for group messages. Please contact your School IT Department for further help about how to use these features. Pros: I use the system on a daily basis. I usually use it to send and receive messages from the parents. Therefore, it's vital for communication between parents and teachers. Cons: There is nothing that I don't like about it. It's always updated and it is clear to use for new users as well. -Easy to use from mobile devices. Cons: -All issues I had with the application have already been fixed/optimized either by my own request or the monthly periodic update. Overall: As an IT Manager in an international school, SCL helped me in managing, communicating and administrat all aspects of the student/teacher/parent process. Pros: I truly liked it, because it made it so easy for us to contact parents and students. Cons: The mobile version, while receiving a message from a parent, it's always hard to know his kid's name. That makes me unable to reply if that parent didn't mention his kid's name. Pros: The system is really easy and friendly user to the staff and for parents. the support system is really fast. has great features that any school needs. Cons: Most of all the problems we were facing were resolved through the constant updating of the software. Pros: It is easy to use, do its function as designed. Usually stable. Pros: It's user friendly I don't face alot of difficulties using it except for the one I mentioned below. Cons: I can't find my new messages easily as they don't appear on top. It doesn't notify me when there is a problem sending a certain message. I have to check my outbox to find out it wasn't sent and without knowing why. I can't search my mail by names so if I want to go back to one of my messages I have to scroll down through all the messages. Thanks for your feedback, but I would like to mention that in Both SCL Web & Mobile you can search for your Messages by name, subject and body. In response to sent messages, all messages sent are normally stored in outbox, but I assume you want to know who didn't receive your Group messages from Students or parent this may be because the parent/student has not created an account or because their account is suspended by school the administration. Once again thanks for your time reviewing SCL, and feel free to contact us for any further support. Pros: The ability to send and receive messages with ease. Cons: The UX could use improvement. People with no computer knowledge would find it a tad bit difficult to navigate. Also, the mobile interface should have all the features the website does. Pros: That the customer support listen and ammend what we need. Cons: The fact that when you receive a message you don't know the grade and class you only receive the name. 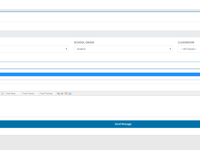 Overall: It's very good this is the second school management system i use and it's way better. Pros: The software is user friendly to any type of user. Also, the color coding feature makes data clear to use. Cons: The software needs to have a drop down menu for the calendar dates. 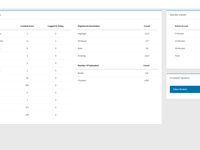 Additionally, the feature for bulk input of data needs to be available. Pros: Organization and the vertical tab instead of horizontal is really useful. Thank you so much. Cons: No copy assignment option available which will meke the time consumed to create assignments much less, and the colors are harsh.